One of my students sent me a link to the ten best graphic memoirs, according to Time. 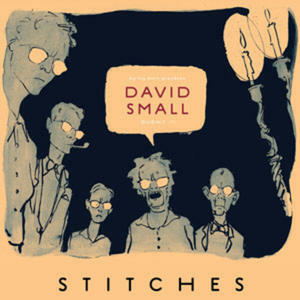 David Small’s book, Stitches, was included. I find graphic memoir (graphic “literature” in general) fascinating. (There’s that annoying question of whether anything created in the comic strip format can be considered LITERATURE, to which I say hell yes, but that’s another post.) Many have commented about how writers contain the uncontainable within the tight frames of comic, and how useful that can be–similar to using tight poetic forms as scaffolding for what is huge, frightening, or unapproachable. I was engrossed in Stitches, for many reasons, and I look forward to reading Small’s books for children. One particular greatness of Stitches was Small’s use of eyeglasses to obscure eyes. In the book, his elders who wear glasses usually have blank space behind the lenses, so their eyes are unavailable, erased, hidden. It’s not until crucial moments in the drama, when truth is being told, or when the character is suddenly vulnerable, that eyes are depicted. This is one of the things that graphic literature can do so beautifully–adding visual layers to the storytelling that cannot be done with words alone. You can get into trouble when depicting ANY character’s eyes doing things, and describing facial expressions in general. Eyes and faces, in real life, do convey nonverbal messages, but it’s difficult to translate these things into prose. Be aware of how you do this, if you choose to do this. It’s often better to let the actions and dialogue of your characters illustrate their inner states of being, rather than description from the outside. It’s always good to be careful with the actions of eyes, for instance “his eyes followed her across the room,” because such descriptions, if taken literally, can draw the reader out of the story. This entry was posted in Uncategorized and tagged books, David Small, fiction, graphic memoir, Interdisciplinary Aesthetics, Stitches, writing. Bookmark the permalink. I loved Stitches — as well as Blankets and Fun Home from that linked list. Just started reading Alison Bechdel’s follow up to Fun Home — Are You My Mother? — which I hear is just as good. Great stuff. (Also, in the YA department, check out American Born Chinese – also v.v.good.) And yes, do check out David Smalls’ picture books — he’s my favorite illustrator working today…. or at least, one of them. You recommended Fun Home to me, which opened this beautiful can of worms! Though I’d already been obsessed with Lynda Barry, too. I will check the others out. I just got this from the library: http://davidsmallbooks.com/catalog.php?t=eulalie_large&p=0 and can’t wait to read it. I do love his illustrations. Thanks! Retraction — American Born Chinese isn’t a memoir, but it (still) is a really good graphic novel…..
Fiction is good, too! I requested it. Thanks for the recommendation! Chris, after you posted, I read and loved American Born Chinese! Thanks for the rec.